This book covers traditions, ingredients, tastes, and techniques. You can discover a mouthwateringly classic cuisine with a collection of 75 authentic recipes. You can explore a creative fusion of regional recipes from the shimmering coastlines of the Mediterranean and Aegean seas to the rural regions of Anatolia, together with the ever-evolving cooking of Istanbul. From simple meze to heavenly-scented Turkish Delight, explore a vibrant cuisine that mixes an enviable range of herbs and spices with dairy produce, fruit and vegetables, meat, fish and shellfish. The tantalizing collection of recipes includes traditional dishes such as Baked Anatolian Humus with Pine Nuts, Ottoman Artichokes Poached with Lemon and Dill, Spicy Adana Kebabs and Rose-petal Sorbet. It includes more than 300 specially commissioned beautiful and evocative photographs. 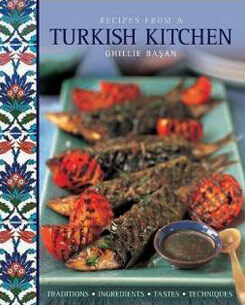 This wonderful collection of recipes evokes the tastes and textures of traditional Turkish cooking – its exciting use of herbs and spices with sweet and salty combinations – and places them in a modern context. Dishes range from easy meze and salads to ideas for stylish entertaining, including soups, healthy vegetarian dishes, fresh fish, succulent meat and poultry recipes, and a tempting selection of desserts and jams. You can discover recipes such as Muhammara, a spicy walnut dip; enjoy a fragrant sour cherry pilaf try a succulent Anatolian spiced rabbit stew or chicken casserole. Drinks and rich, creamy desserts such as Poached Apricots Filled with Buffalo Cream or Sutlac – the best ever rice pudding – are also included. The Turks are well known for their lavish hospitality – and this sumptuous book will provide all the inspiration you need to follow their example.